Claims : Hand made carbon black collected from vegetable oil lamps combines with organic ghee (clarified butter) natural mineral colours and organic sweet almond oil to make this kohl safe and give it a colour that will highlight your eyes and keep them cool. Contains No Paraben or Lead. With Organic Ghee. Natural Mineral Colour. 100% Natural. Not Animal Tested. Made from camphor and organic ghee the kajal has a soothing softness that keep sthe eyes cool & clean. The natural pigments enhance the natural beauty of the eyes. Organic Ghee and natural pigments are the main contents of this kajal and that's what made me try this out. So, the Soultree herbal kajal comes in a outer box packaging, which looks really pretty. One the side of the box, all the shades present have been mentioned. There are shades like copper tint, true blue and carat among 9 others. I got this kajal in the shade 011 pure black. So, this organic kajal comes in a plastic stick retractable packaging and thus, there is no wastage of product as you do not have to sharpen it. It has been made by a traditional ayurvedic recipe using a 3000 year old process and it has a 100% natural composition. Thus, this is a natural kajal. Camphor content in it is for cooling purposes, although it is really mildly comedogenic. It has not been tested on animals and is hence cruelty free. It definitely is expensive but for my eyes, this is an investment as it won't harm them at all. I started using it and then noticed that it gives my eyes a mild tingling sensation for about sometime and then it goes away. My eyes did not become red or irritated though. Sadly, this is neither smudge proof nor water proof. So, if you are looking for these two qualities then better consider other options like Eyeconic eyes kajal by Lakme or Maybelline colossal kajal that I got in my Maybelline Instaglam Valentines Gift Kit Coral. It hardly stays on my eyes for 2 hours and then melts and smudges pretty badly. I then have to wipe it off and reapply again, which is a tiresome process. Also, the color is not that intense. But even then, I like it just because it did not cause any sort of problem to my eyes and then chemical content in it is lower. So, if you have sensitive eyes, then try this out and your eyes will thank you. This kajal is also a good option for college going girls or school going girls who want to attain a really mild makeup look. It is not that perfect eye definer but works nicely on my eyes. Atleast, does not harm them. I would not be using this everyday but I do use this occasionally, when I feel the need to let my eyes rest a bit. Would I recommend Soultree Ayurvedic Kajal? 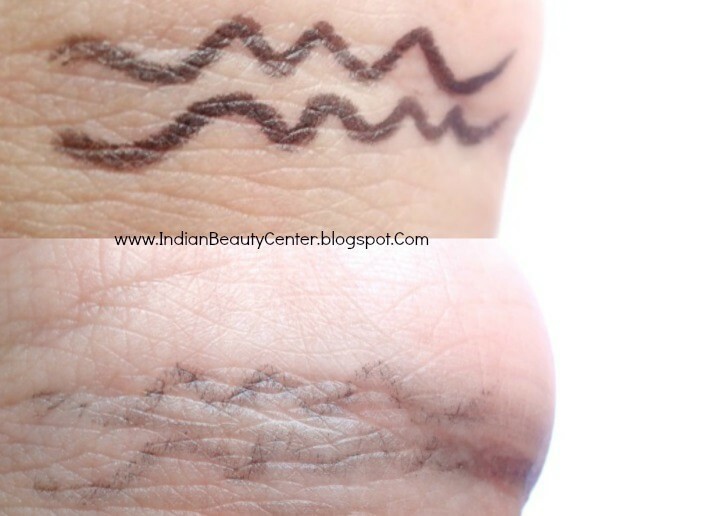 Overall, this is an okay-ish product but if you want something smudge and water proof then go for maybelline kajal (Maybelline Colossal Kohl Turquoise Review). This did not irritate my eyes and its ayurvedic compostion is great for the sensitive eyes. This smudges more than the Lakme Kajal. Wish the staying power was longer...You may buy this is if you have sensitive eyes or want a herbal/ayurvedic/natural kajal. It's pricey but I can gift it to my mom. She is pretty much allergic to everything synthetic. It tingles my eyes a bit too! I gave it to my aunt. Didn't like it much. Love my colossal kohl in black. It is always safe to use ayurvedic kajal but as u said it smudges alot toh I will stick to my Eyeconic kajal.. Thanks for sharing wonderful review. It is a nice kajal. Good for eyes. Nice review dear.